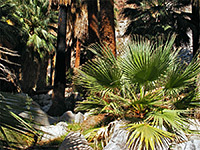 The California fan palm oasis in Fortynine Palms Canyon is generally considered the finest of the six in Joshua Tree National Park owing to its pristine condition, scenic setting and relative ease of access, though the 1.6 mile hike to the trees can still be quite strenuous in hot weather. 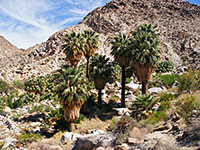 About 50 large fan palms plus many smaller specimens grow at the junction of two forks of the canyon, surrounded by particularly barren, rocky, desert slopes, fed by fresh spring water that flows just 500 feet or so before sinking below ground or evaporating. The canyon, now dry and exposed, can be followed further upstream though most people only visit the oasis. Fortynine Palms Oasis topographic map. 9 views along the trail to Fortynine Palms Oasis. The oasis, which is not well signposted, is located in the hills close to the northern Joshua Tree National Park boundary, reached by driving along a short residential street (Canyon Road), on the west edge of Twentynine Palms. The road enters the park, climbs a short distance and ends at a large parking area by the trailhead. This section of road is gated at dusk to prevent overnight parking - a pity since the carpark would be a good place for camping, well away from any houses, and with nice views of the surrounding rocks and towards the town in the distance. The well marked path ascends steadily though not too steeply across open, rocky slopes bearing creosote bushes, Jojoba, barrel cacti and opuntia, up 300 feet to a ridge overlooking the town. The harsh, dry conditions cause even the native Mojave desert plants to be smaller than usual. 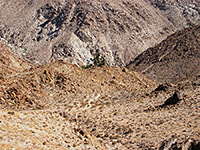 The path climbs a little further, passing over two other ridges then starts to descend across equally arid, empty terrain towards the oasis - a bright patch of greenery in the enclosing greyish-brown slopes, visible from half a mile away. Near the canyon, the path winds through a group of boulders and ends right amongst the cool, shady palms, which grow in several groups arranged around small greenish pools and trickling streams. The taller trees are mixed with many baby palms, large spiny lizards hop around the rocks, and the whole place seems very healthy despite the occasional wildfires that affect the oasis, evident from the blackened trunks of many of the older trees. Up the canyon, past a thicket of reeds, willow and tall grass, the ravine quickly reverts to barren desert once more.